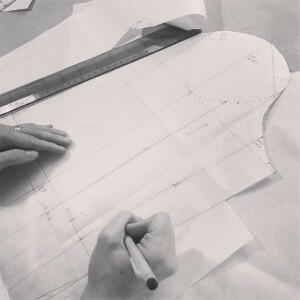 I am so excited to share with you that couple of weeks ago I have started a pattern cutting course with Inseam Studios . This was something I wanted to do for a very long time, but with full time job and part time University study there was little time left for any social activities, yet alone another course. But this time is nearly over now, with my last exam behind me (still waiting for that results….biting nails), I have more free time, so what better time to learn some pattern cutting yeahhhh . My dream is to make clothes that fit me well and this course will teach me how to construct a basic block patterns based on MY measurements! Isn’t that amazing??? No more adjusting patterns (fingers crossed), no more wasting a precious fabric! The course is 30 hours long, which can be spread out to my own needs. Having a one on one lesson gives me lots of opportunities to ask tons of questions and Aina is always happy to answer them all. She is a fantastic teacher, who is patient and explains everything in a clear and easy to understand way. Aina is very talented and has her own clothing label as well as a teaching pattern cutting and sewing. As you can see there is still so much to learn, and I am loving every minute! If you are thinking about learning pattern cutting I would recommend a booking a trial lesson with Aina. This is what I have done, to see if one on one lessons is something I would enjoy and to check if I will benefit from them as much I want to.